In the dead of night, a cloaked figure drags a heavy box through snow-covered streets. The chest, covered in images of mythical beasts, can only be opened when the fangs of its serpent’s-head clasp taste blood. Centuries later, in an Oxford library, a boy touches a strange book and feels something pierce his finger. The volume is blank, wordless, but its paper has fine veins running through it and seems to quiver, as if it’s alive. Words begin to appear on the page–words no one but the boy can see. 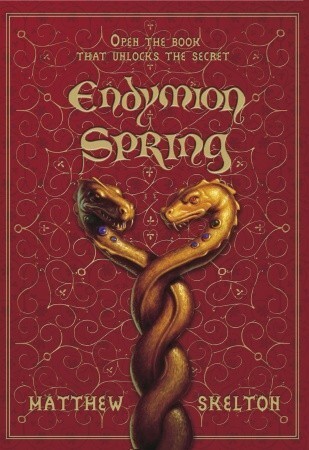 And so unfolds a timeless secret . . . .
A mix of historical mystery and young adult fantasy, Endymion Spring was a pleasant read about the search for a book made from a dragon’s hide. It wove the stories of Endymion Spring, 15th-century boy who worked as a typesetter for Gutenberg (the man who invented the printing-press) in Germany, and present-day Blake Winters, spending time with his mother and sister in Oxford. The book was supposed to reveal all knowledge and can only be read by an innocent. It is so sought after that Faust was said to have made the bargain with the devil because of it. Books about books are always fascinating to bookworms. I was tickled by the idea that the magical book’s creation paralleled the invention of the printing press and evolution of printed books as we know and love today. Endymion Spring is rich with the magic and mystery of libraries. It also has intrigue, family issues and a scruffy gray dog. I liked all these elements. I didn’t like the interaction between brother and sister. I didn’t much like her. But I thought at least she had personality and was not just a character prop to fill up space. It is also a stand-alone story, appealing to me further as my mood when I picked up this book was for something heartwarming and exciting but will not take up too much of my time. I think it will definitely appeal to younger readers. If you do pick it up, please read the author’s story of how he came to write this book. It came to him in a dream in which a young boy was trapped in a college library with a dark, sinister figure…. So what happened next?